We love to celebrate the 4th of July outdoors enjoying grilled main dishes, cold sides, family-friendly activities and a few fireworks!! With 4 little ones, we also incorporate fun outdoor activities to keep everyone entertained throughout the day. 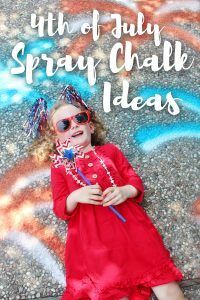 This year, we are sharing 3 easy patriotic inspired outdoor spray chalk ideas, and hope you love them! Spray chalk is an amazing medium for creating fun photo concepts on virtually any surface area; it works on grass, concrete, asphalt and even snow! Whenever hosting an event, I try to create a fun activity that can also double as a photo op to capture guest memories. 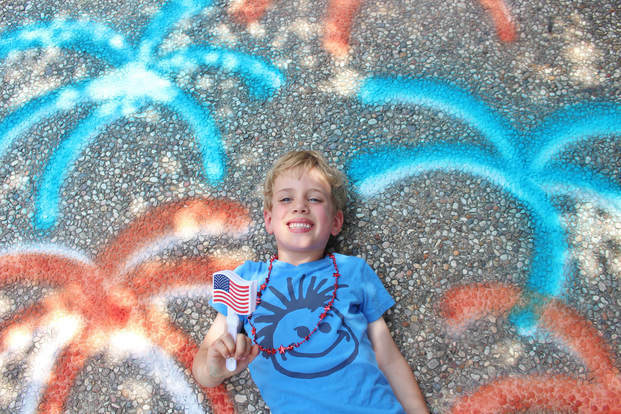 For the 4th of July, I designed this simple red, white and blue firework backdrop on our driveway using Testors Spray Chalk. 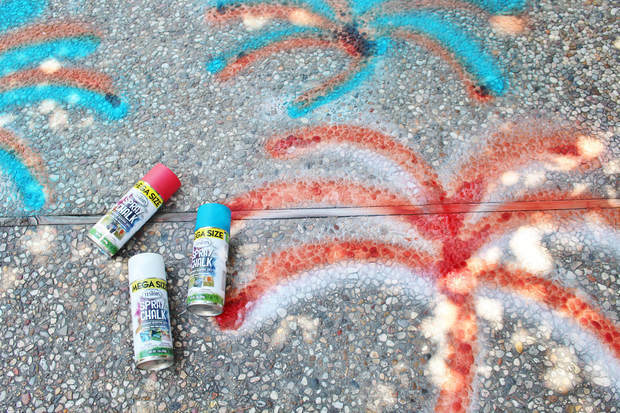 Simply select a primary color to begin spraying your design; I free-handed the base of the firework using red or blue, then sprayed over it with white for a multi-dimensional effect. The entire design can be created in just minutes and it will generally last for several days. 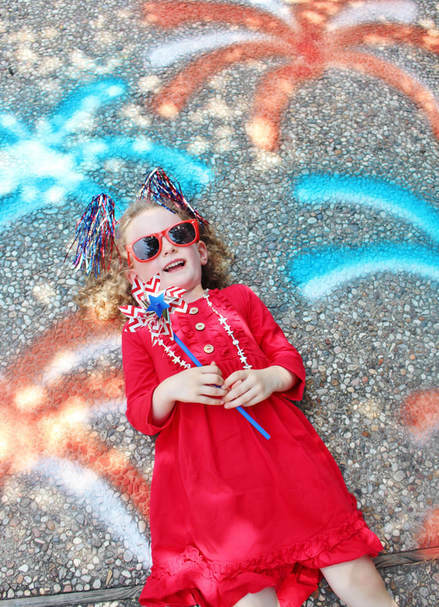 To liven up the photos, set out a few patriotic props such as sunglasses, necklaces, noise makers and headbands! The sidewalk leading to our home is brick, and slightly curved. 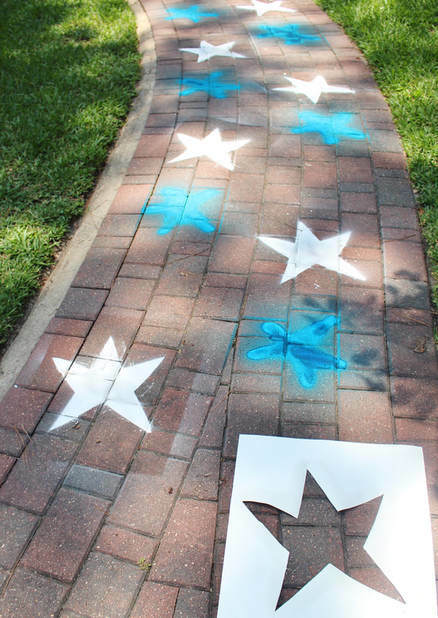 For family-friendly events, it’s fun to add colored designs using spray chalk to the walkway welcoming guests. 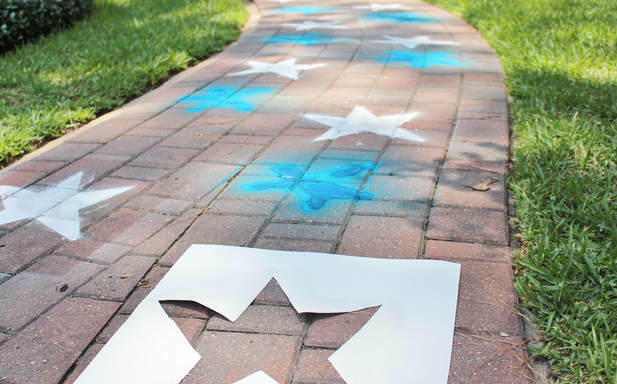 For our 4th of July festivities, we created a simple star template using poster board and scissors, then sprayed alternating blue and white stars from the driveway to the front door. While this was meant to be purely decorative in nature, the kids had fun coming up hoping games with the stars, which was super fun to watch! 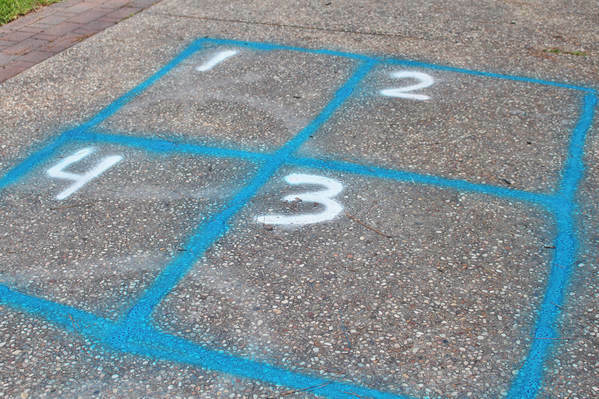 My school aged kids love the game of four square. In fact, they had to re-teach me the rules for playing the game. 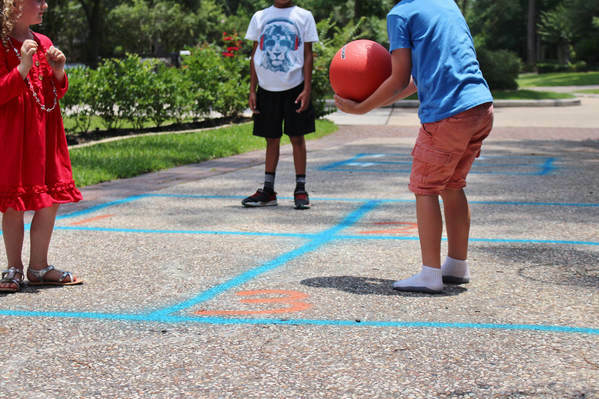 With a can of spray chalk and a bouncy ball, you can create this fun outdoor game to entertain party guests for hours. Simply spray a large square using a spray chalk color of your choices, add the interior lines to create four squares, then add the 1, 2, 3, 4 to one of the corners. It’s that easy! All of these spray chalk ideas can be created using a single box of Testors Spray Chalk within minutes!! 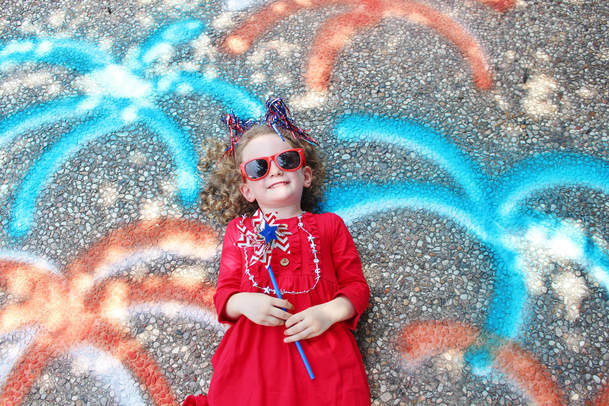 We can’t wait to see what fun ideas you come up with for the 4th of July weekend!